Home News Bedford County Goes Live on SPARK! 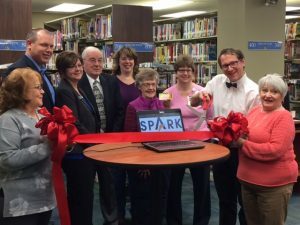 Bedford County Goes Live on SPARK! Pictured in the photo (left to right) are Gail Claycomb Smith, Bedford County Chamber of Commerce; State Representative Jesse Topper; Tonya Clark representing State Senator Wayne Langerholc; Paul Crooks, Bedford County Commissioner; Gwen Querry, Downtown Bedford Inc.; Dorothy Egolf, Bedford County Library Board of Directors; Annette Godissart, UMPC Bedford; Matt Godissart, Bedford County Library System; and Peg Koeng, Bedford County Chamber of Commerce Ambassador.